The first time I ever heard someone talking about planting potatoes from seed, I wondered to myself, “Where are the seeds in potatoes? I’ve never seen seeds.” I was completely serious. I can laugh at myself now, knowing what I know, but for those who are starting out where I started out (completely naive), let me fill you in. 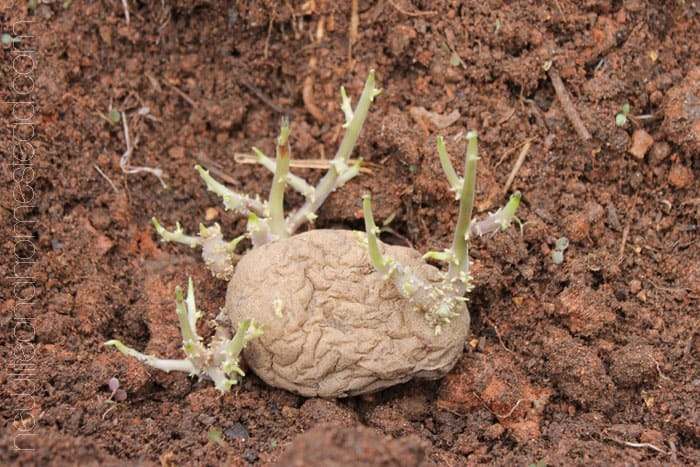 This, my friends, is a “seed potato”– otherwise known as an old, sprouting potato spud. Once planted, those sprouts will grow into beautiful green plants, and the developing roots will form brand new potato tubers in the ground below. Sometimes when you buy seed potatoes they may not be sprouting yet. That’s okay. The sprout will grow at the “eye” of the potato over time, whether left in a pantry or buried in the garden. Although potato plants do bloom and go to seed if you leave them long enough, potatoes are not typically planted from these seeds. Most people plant potatoes from sprouting spuds, however you can collect the seeds from a mature potato plant and grow more plants from true seed. 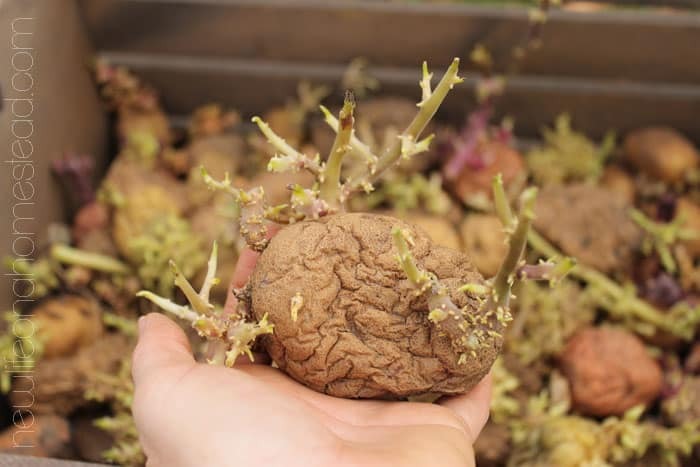 I have to warn you though, potato genetics are funny, and most of the time you never know what kind of potato you’ll end up harvesting when planted from true seed. It is likely it will not be the same kind of potato you originally planted. Might be a fun thing to experiment with though! My seed potatoes are potatoes that are leftover from last year’s harvest. They’ve been sitting in a crate in my kitchen since last Fall. They shriveled before we could get to them, so I let them sit and sprout, waiting to be repurposed in this year’s garden. Every now and then I sorted through them and removed any rotten potatoes. There weren’t many, but a few. I love growing colored potatoes alongside our white ones. 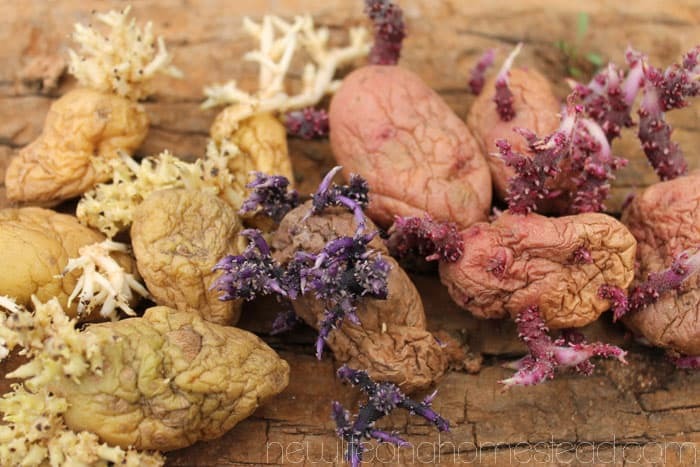 These purple and red potatoes have gorgeous sprouts, don’t they? Over the years I’ve tried many different ways of planting potatoes. I’ve tried planting in post holes, traditional mounds, trash cans, using the “no dig” method, planting in tubs… all of which had pretty dismal results. 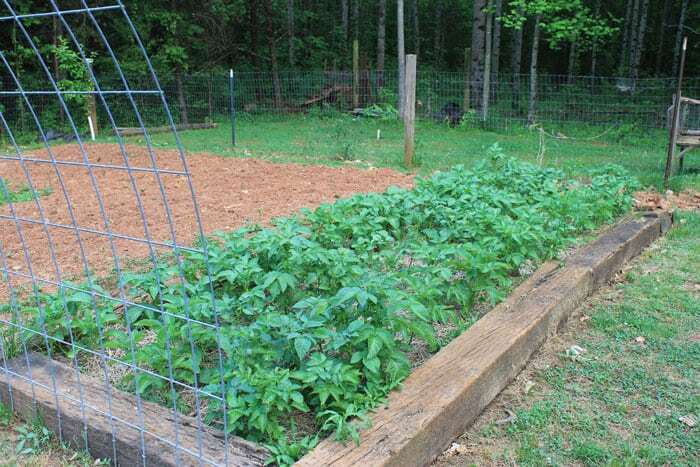 Planting in raised beds has by far provided the most abundant crops. 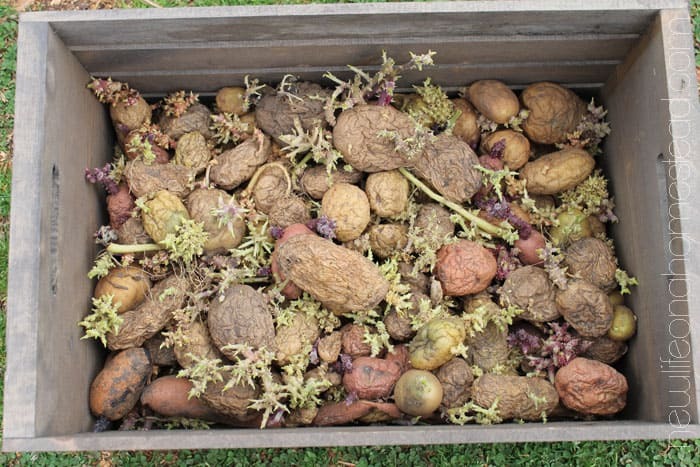 We harvested over 100 lbs of potatoes last year from two 5′ x15′ raised beds! I’ll definitely continue planting in raised beds from now on. First, dig a long trench for your potatoes to be buried in. I use a hoe and dig down as deep as I can to the hard soil at the bottom of the raised bed, about a foot deep. You want to at least be able to cover your potatoes completely with soil. Space the rows about 18″ apart. If you have a limited supply of seed potatoes, you can cut them into quarters or halves, making sure each chunk of the potato has a sprout or eye on it- otherwise it won’t grow a plant. If you plan on cutting your potatoes, give them a couple of days to “cure” so the cut side can dry up. Curing reduces the chances that your seed potato gets a disease. I don’t cut my seed potatoes anymore because I have more than enough to plant our beds using whole potatoes. When you put the sprouting potato in the ground, make sure the sprouts are facing up. Space each seed about a foot apart in rows. 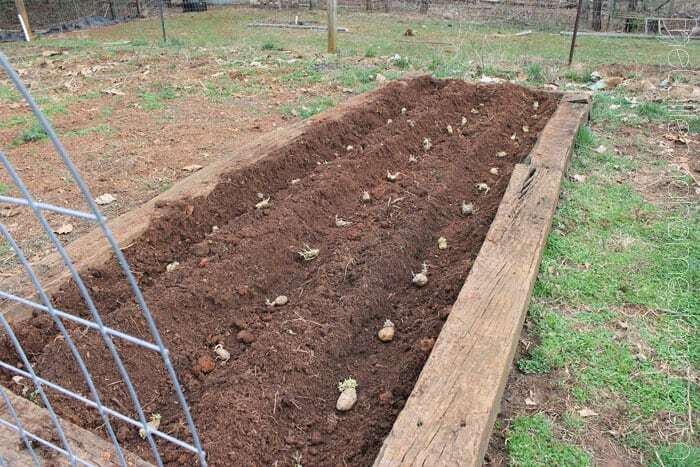 Once the rows are filled, cover the potatoes with dirt and mulch heavily with straw, grass clippings, pine needles, or crumbled leaves. As the plants grow, add more soil or mulch to cover almost all of the plant to encourage more tubers to develop along the root system. I’ll try to remember to update this post as our plants grow. Hoping for another bountiful harvest this year! It’s May now, and the potatoes are looking great! If I had another row of railroad ties that I could stack on top of these and fill in with more dirt, I’d get way more potatoes. But even in the 10″ of dirt they’re in we still expect to harvest another 100 pounds or so. With further research, I have learned that it is actually illegal to use railroad ties in the garden. If you already have beds made with them, replace them with anything else and throw them in the local landfill. They have been encouraged by the EPA specifically not to be used in the garden because they are considered toxic. As they break down they release dangerous chemicals that are persistant in the soil for a very long time. I know they look pretty and are cheap but they do not belong near your food source! This is a big big deal that is extremely dangerous and I really am not overreacting. Please reconsider advising people in this article to do something so dangerous! When you add mulch/dirt to the growing potatoes, do you cover the green sprouts/leaves coming up? Everyone says to add dirt, but I’m having trouble picturing how that works. I have double stacked railroad ties for my raised beds. I had “cherry picked” them from a huge pile a gentleman had. He let me pick through and he used a piece of heavy equipment like a ‘log picker’ to get the ones I want. My criteria was simple, the grayer the better and they had NOT have rotted ends. When I got them all home, my helpers dumped them in the yard. I only noticed bubbles of creosote on one. I used the others first and put that one on the top layer- not touching plants, and draped a long piece of heavy plastic over it and down into the garden. Bottom line – older = less creosote. Seven years later, no creosote leaking and I love the high, sturdy raised beds. I can sit on the edges. Creosote is still in the ties for some time. You likely are ingesting and you do not even know it. Trust me I worked on a rail line and have wayyy too many hours around that crap. The easiest way to solve this problem is by using a plastic liner, for some odd reason plants supposedly do not absorb the chemicals from plastic, not sure I buy that but there is no scientific data to say that it happens. Please, seriously be careful with the ties and pressure treated lumber. I just wanted to agree with Shrek about how you should not be using old railroad ties. They can be quite toxic for a long time. Its too bad because I know they seem so perfect! How late can you start seed potatoes? We usually plant in Spring or Fall. Typically when we plant in spring, we harvest in late summer. The potatoes are stored and what isn’t eaten by the following spring has begun to sprout and can then be planted again. We plant potatoes in truck tires. Used to be tires had a trade-in value, now you have to pay to leave them at the tire store. Throw a tire down, add good soil and chunks of seed potatoes. Keep adding soil as the potatoes grow until they are above their tire. Add another tire and keep going, adding soil as needed. Ambitious folks can cut the beads out of the tire with a Saws All and a demo blade, but it works leaving the tire as-is. Keep adding a tire until the pile is four high. You can put Re-may on top to discourage the beetles, if you want. When the killing frost hits, grab a doughnut and a cup of coffee and go lean on the pile of tires … until it tips over. You have just harvested your potatoes. The tires will keep for about 30 years or more, so pick a kid to bequeath them to. I’m in New Hampshire next to a lake so although my basement stays cool year round, it is pretty damp. What can I do to store potatoes over the winter. And I’m not spending $40 per month to run a de-humidifier. I think I saw once you could cover with dry sand and they’ll last longer. I would store them in the house instead of a damp basement. I store mine in my kitchen in a bin under the counter where they stay dry and around 70*. WHen my husband cleans the fish we catch he takes the head and bones to the spot where we plant our tattors and tills them under. It is great for the soil and grows huge potatoes. Will it attract any flies? Buried in the ground? No. I’ve had great success with potatoes the past three years… (Hey, I AM in Idaho! Ha!) Here is a vid from 3 weeks ago. We finished planting the whole garden today. These ‘taters are pushing up through the ground now! I tried planting potato seeds last year in my raised garden. Got about 30, the size of a dime. 🙁 any idea what I did wrong? Maybe they didn’t have long enough to mature? How long did you leave them in the ground? 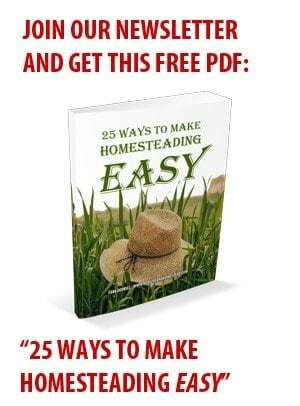 If I lived in a place where I could not grow my own food I would move! My family has been growing our own food my whole life. I remember when the cart at the gro. store just had staples in it, flour sugar, corn meal etc. I remmember when my grandmother bought her first paper plate. she thought that was the greatest invention ever! For a period of time we raised our own beef and pork, chicken and eggs! We fished and hunted, Life was great! Then one day our family desided we needed to make money from an our source. THat is when life went to Hell so to speak! we were just farmers, some would say we were poor, but I never knew it! Sounds like you grew up during a great time, Steve. If only we can get back to such simple joys. I see in the stores now that you can buy the small potatoes. About golf ball size. They are in small packages. I thought if these sell good, they might move to a larger bag. We always went through all the rows and picked the small ones too. They are wonderful to use and you have to save on the grocery bill if you run out of your regular potatoes that you raise. The kids thought they were really helping by picking up the small ones. And that is true. My friend broke the 3″ sprout off a seed potato accidentally. She put just the sprouted part in a flower pot to see what would happen. It grew a potato. The potato she broke it from grew a potato, too. Potatoes are on my mind too. 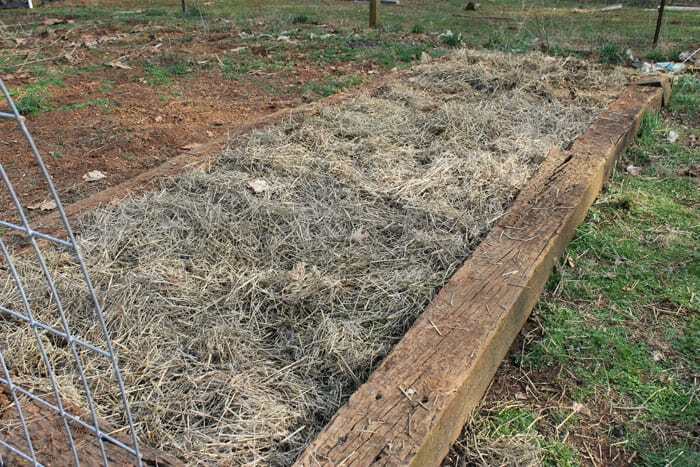 With our clay rocky soil–and gophers, we only grow in raised beds. On whim, I picked up in inexpensive a small package of “gourmet organic” fingerling potatoes in a variety. I cut them, cured them on my kitchen window sill, then tossed them into my SmartPot planter. Now I have about 20 pounds of fingerlings to harvest. I have limited space in my backyard garden so I’m doing an experiment in a few raised beds this year. In one bed I dug out a bed section at a time (all the way down to hard pan, approximately 24 inches) and put down my seed potatoes. Dusted them with DE (Diatomaceous Earth)then covered them with plenty of dirt from the middle section of the bed (double digging) then put down a layer of compost (taters love their compost!). On top of that I put down garlic cloves, covered them and at the very top of the bed I put down seed of Romaine, Pak Choy, Swiss Chard and Spinach (Cool short season). The seedlings on top have already started germinating so I’m hoping they will get a root system established before the potatoes make their appearance. I’ve planted potatoes in other places in my garden, harvested them and planted other things just to find that one little tater popped up that I had missed. Everyone seems to get along so I’m doing ” French intensive intentional” in layers. In another raised bed I put down potatoes and garlic only, so I can do a comparison. In another raised bed I planted the potatoes and garlic last fall at harvest time and right now the garlic is knee high and the potatoes are putting out leaf, about 7 inches high. All beds are identical in size and depth. I have one raised bed left and last year another bed did very good with sweet corn & Bush beans with lemon cucumber and zucchini at the sunny sides. I have (2)10 ft. ground rows that I planted in potatoes last fall. This is a repeat rotation from 2 other ground rows harvested last fall. I just plant all the unusable potatoes, roots, eye stalks & green leaves, the whole plant gets tossed in the row. 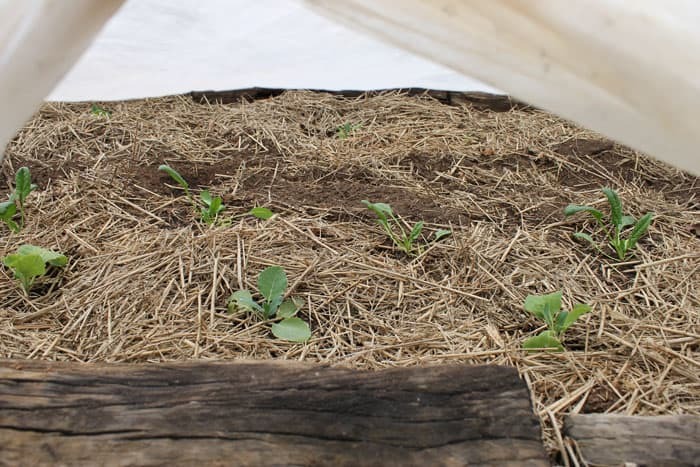 Cover with soil and then I composted on the top of the row through the winter then cover the compost with a tarp. Keep those taters warm and fed in the winter! I pulled the tarps off about a week ago, any compost needing more time was put into a current heap and the tops are breaking surface now. My last years harvest was huge and I had reds 7 inches long. (About the eye sprouts): You can break those off your potatoes and start new plants from them in moist seeding soil. Done right one potatoes can make a hundred plants! I’ve also broken them off and raised them in a glass dish with diluted organic liquid fert. Yuppers! They do what they do best, grow roots! That sounds AWESOME, Sheri! I’ve never done French intensive planting. That sounds very interesting to me. Let us know how it goes! 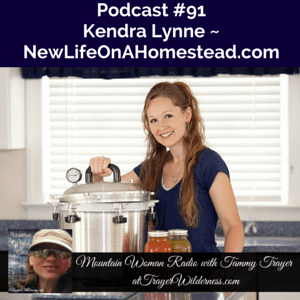 In regard to “cutting” potatoes to increase your overall number of planting …. besides leaving a few “eyes” on each piece the most important step is to allow the cut raw skin areas to dry and heal over …. You’ll have planting failures cutting and planting immediately …. Yes, Illini Warrior. That’s what I meant about curing the cut potatoes before planting them. I would probably wait until the ground dries up. If the potatoes stay damp for too long they’ll just rot. Oh my but you would laugh if you saw my potato seeds. Our purple potatoes from last year were quite small and I didn’t use them all. Went to the basement the other day and found exceptionally long spears sticking out of the potato basket. Husband laughed. Each potato must have an 18 to 24″ running coming out of it. They apparently were reaching for the small amount of light coming thru the basement window. I wasn’t planning on planting anymore purple because of the small size, but I may have to plant some since they went to the bother to get such nice long shoots on them. Your seeds look really nice. Last year was our first year for potatoes and it was so much fun growing them. It was like digging for buried treasure. I LOVE digging for potatoes, Kathy. It is just like digging for treasure, lol. And it never gets old to find another potato in the bed. I actually just dug up a perfectly good, BIG potato from last year’s bed. I thought they’d rot over the winter or something, but it was totally fine. I wondered about leaving all of them in the ground and just digging them as we want to eat them. It wasn’t even sprouting yet. Interesting. My seed potatoes were like that last year. Good 16″ runners on all of them. I planted my potatoes after most other people but had taters a week or two before them. I planted them just as deep as I could dig. You just have to be very careful not to knock off the runners while planting. Great advice about being careful with the runners/sprouts, Yolanda! I forgot to mention that. Some of my potatoes were very small last year, but they made the BEST Roasted potatoes with herbs or new potatoes sauteed in butter with onions. The taste and flesh couldn’t be compared to the blemished things you get at the grocery store now. A good part of the potato has to be cut away from store bought potatoes. Can’t wait for this years crop!